Extremes, especially those of a bizarre nature are a subject of great interest to man. While many spectacular accounts detail human sports achievements or abilities, we will turn to the avian world to look at the most incredible traits, abilities and superpowers of the most extreme birds on Earth. In this fascinating account, we learn about the bird that can outperform a submarine, the fastest raptor on the planet, and the bird that can do a full barrel roll in flight. The Peregrine Falcon is the fastest predator on the planet, bar none. Peregrine eyes are over 12 times as powerful as a human eye, and can spot a small bird up to 5 miles away. Once a bird is sighted, the peregrine folds its wings and enters an angle swoop in which speeds of over 300 kilometers per hour are reached. Unlike most birds of prey, the peregrine does not slow down or use its talons, but hits its prey at full speed, killing it with a blow from its keeled breast bone. Once known as the “duck hawk” Peregrines Falcons are actually more closely related to parrots than hawks and eagles according to leading research. Additionally, Peregrines have a keratin bill tooth to sever the spine of captured prey. In general, raptors are the fiercest avian hunters, and most prey stand little chance against the fighter pilots of the natural world. However, in the process of evolution, four raptors have avoided competition by specializing in decidedly bizarre diets. European Honey Buzzard, for example uses its talons to empty beehives for the honey. As it is fond of adult wasps, this bird may place some of the meat in a tree and waits for a scout hornet to arrive. The Honey Buzzard then follows the hornet and proceeds to raid the wasp nest. While most kites swoop down after small birds, the rare Everglades Snail Kite feeds only upon Pomacea Apple Snails. Africa’s Palm Vulture is an eagle that feeds primarily on palm fruit, and finally, the Lammergeyer Vulture depends exclusively on bone marrow extracted from carcasses rather than the expected carrion. In the Aesop’s Fable account of a contest to find the highest flying bird, the Eagle appeared to win, until a hummingbird buried in the eagle’s feathers emerged and flew just above the great hunter. In fact, the Eagle is not the highest flying bird, and it loses the contest to a rather surprising winner. 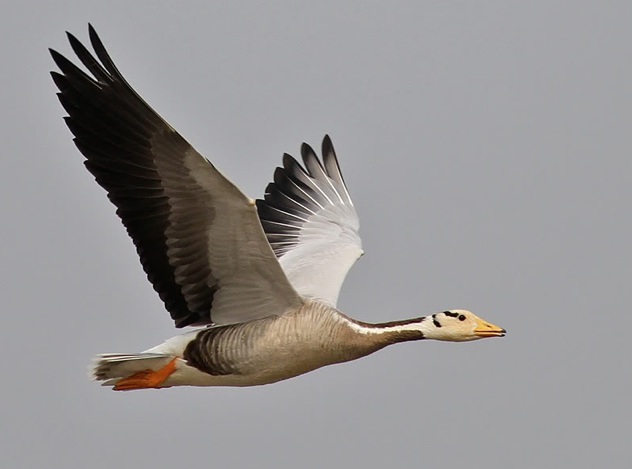 The highest flying regular migrant is the Bar-headed Goose, a large waterfowl native to Eurasia, with a migratory route taking it from arctic breeding grounds to the sub-tropical estuarine deltas where it winters. To clear the Himalayas, the Bar-headed Goose ascends to heights over 21,000 feet, and has been spotted from airliners gliding right over the peak of Mount Everest. Unprotected flight at such altitudes would kill most species without lengthy acclimatization, including humans. Penguins are famous for their almost human-like appearance as they step across beaches in Antarctica, Australia, Africa & the Galapagos Islands. However, the diving abilities of these ancient birds are no less than super-human. 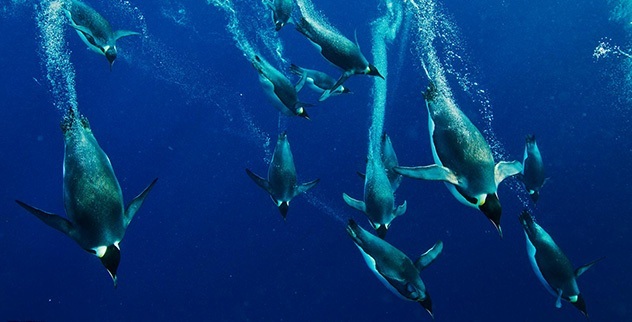 While a dive of around 200 feet is an achievement for most waterbirds, the Emperor Penguin is capable of diving to a shocking depth of over 1,500 feet thanks to an incredible twist of physiology that allows it to metabolize oxygen at a slower rate in dives than it would during rest. Additionally, the Emperor Penguin and its runner-up cousins have special adaptations that allow extremely low blood levels of oxygen that would kill a human in minutes to be tolerated by the brain. The male Emperor Penguin may also go without food for over 130 days during egg incubation. 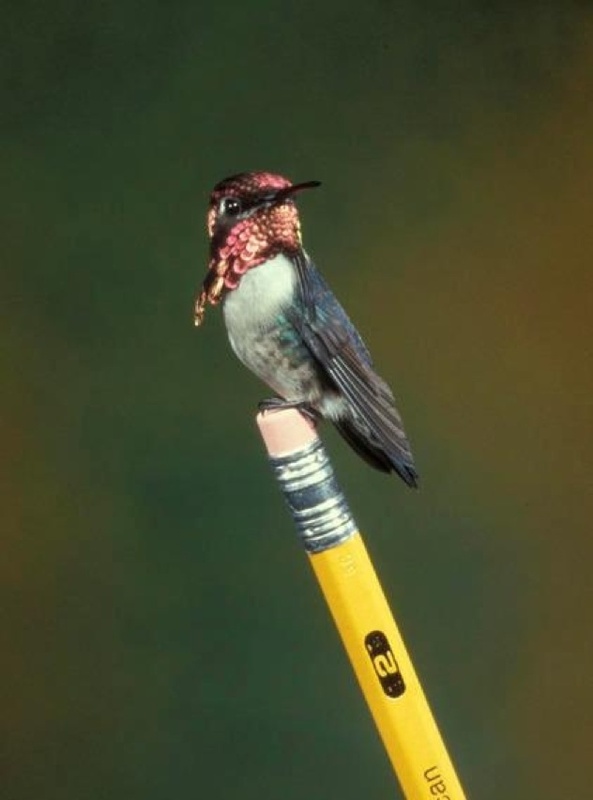 The smallest bird on the planet is the aptly named Bee Hummingbird from the remote rain forests of Cuba’s central mountains weighs in at a mere 2 grams, and 2 inches in length. A bird so tiny has an extreme metabolic rate and limited ability to process many foods. In order to survive, the bird forages on pollen grains, which provide the energy to sustain its 60 to 80 wing beats per second. Bee Hummingbirds are essentially predator-proof, having very few natural enemies due to their incredible speed and minute size. Many species of moths, spiders, and even the namesake bees are actually larger than this tiny feathered creature with a sharp bill and vertebrate intelligence. We are familiar with the loud cries of gulls, crows and hawks, but the record for the loudest and most piercing bird call goes to a songbird. The Three-wattled Bellbird is native to South America’s rainforest regions, but its call appears starkly alien in this remote environment. Sounding like an industrial warning buzzer, the bird may be heard over 1 kilometer away. This species is a member of the Wattlebird family, named after a bizarre set of three fleshy tendrils that dangle from the bill like a creature from Pirates of the Caribbean. Wattlebirds are the noisiest species on the planet, and the bizarre three-wattle is among the noisiest of this elite group of racket-raisers. When asked to name the most primitive living bird, flightless species such as Ostriches may come to mind. Actually, the most primitive living bird appears to be South American relict from the dinosaur era that has not only gained the abilities of flight, but retained reptilian claws on its forearms. The Hoatzin is a relative of the Cuckoo that inhabits riverside forests. When the young hatch, small claws extend from the wings, and are used by the young birds to climb among the trees as they feed on leaves. As adults, the claws disappear, but the birds continue feeding on leaves through their cow-like digestive systems in a marked departure from the protein rich diet of most modern birds. Of all the birds living on Earth, it should come as no surprise that an eagle ranks at the top in the category of sheer strength and killing force. The Harpy Eagle of South America, named after the Greek winged spirit of theft and plundering crashes through the peaceful forest canopy with force of a charging leopard. The immensely powerful harpy seizes its monkey or sloth prey in its massive talons, which are the largest of any living bird. Pressures of over 500 pounds per square inch may be delivered by the talons, which are capable of breaking a human arm with a mere squeeze and piercing the shells of armadillos. Prey equal or greater in weight to the 22 pound eagle may be taken. By controlling middle predators that raid nests, such as monkeys, the Harpy actually protects many tropical bird species. 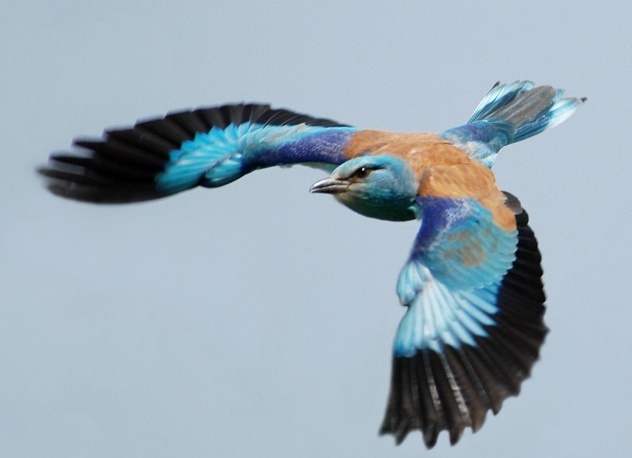 The European Roller is in fact a bird, but a casual onlooker might very well mistake it for a small stunt plane. Native to Bavaria, Eastern Europe and the Mediterranean, the “Roller” is named for its ability to pull off a full speed, 360 degree barrel roll in mid-flight. Resembling a starfighter in combat, the Roller twists its feathers in an opposing pattern to disrupt lift to the wings, causing the bird to flip and perform a complete rolling maneuver. The move shows off the male’s flying skills, and serves as a core part of the mating display. The birds may also perform the maneuver for apparent practice, or when hunting prey. The field of ornithology and bird conservation is evolving as one of the leading aspects of natural science and wildlife protection. 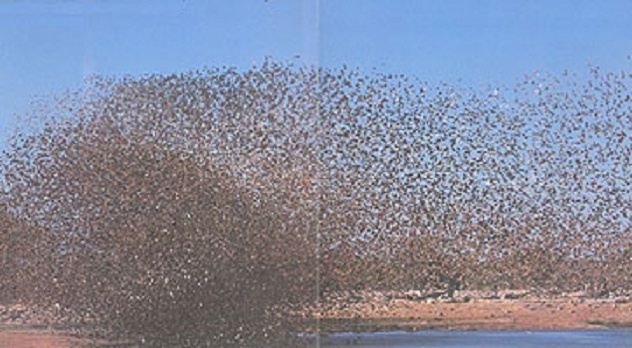 However, conservation is turned on its head when plagues of birds come into conflict with humans, presenting an Alfred Hitchcock like scenario in real life. Africa’s Red-billed Quelea, a “weaver finch” is known for building bizarre communal nests that may engulf entire trees. Over 1.5 billion birds have been counted, and a super swarm of close to 10 billion individuals is believed to exist. Descending on crops, these often too successful birds may strip fields bare within hours, leading to culling of millions of birds. These culls have no effect, and tragically, have resulted in the deaths of many rare waxbills that join the flocks. Ron Harlan investigates of the mysteries of nature and the bizarre findings that often crop up on this planet. He is a freelance writer and student of science. Contact Ron for content writing services.